Book DescriptionThe Italian Game (sometimes referred to as the Giuoco Piano) is one of the oldest openings around, and also one of the first lines a player learns when he or she is introduced to chess. It leads to play that is easy to understand: both sides develop their pieces logically and begin attacks on the opposing kings. The Italian Game gives both White and Black the opportunity to play either aggressively and in gambit fashion, or in a restrained and positional manner. One of White's most exciting and attacking options is the legendary Evans Gambit, which has been brought back into the limelight in this modern era by such uncompromising players as World Champion Garry Kasparov, Alexander Morozevich,and England's Nigel Short. 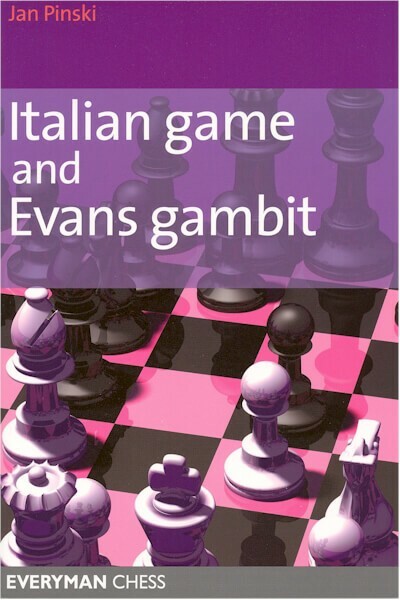 In this book, openings expert Jan Pinski investigates the different strategies and tactics in the Italian Game and Evans Gambit. Using model games for both White and Black, Pinski provides crucial coverage of both the main lines and offbeat variations. This book arms the reader with enough knowledge to play the Italian Game and Evans Gambit with confidence.